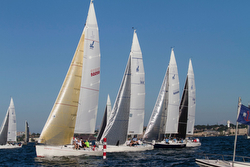 (Newport, RI)- Thirty-five J/70s will be plying the waters of Narragansett Bay this coming weekend in the annual New York YC One-Design Regatta. 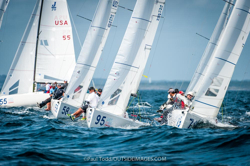 The fleet is comprised of numerous one-design class National, North American, and World Champions, most of whom are sailing the regatta as part of their training programs leading up to the J/70 World Championship, hosted by Eastern YC in Marblehead, MA later in September 2018. The headline crews include such class leaders as Joel Ronning’s CATAPULT from Excelsior, MN; Jack Franco’s 3 BALL JT from Lakewood, TX; Glenn Darden’s HOSS from Fort Worth, TX; Martie Kullman’s HYDRA from St Petersburg, FL; Jenn & Ray Wulff’s JOINT CUSTODY from Annapolis, MD; Jim Cunningham’s LIFTED from San Francisco, CA; Peter Cunningham’s POWERPLAY from Cayman Islands; John Brim’s RIMETTE from Fishers Island, NY; Pam Rose’s ROSEBUD from Chicago, IL; Bruno Pasquinelli’s STAMPEDE from Fort Worth, TX; John & Molly Baxter’s TEAM VINEYARD VINES from Riverside, CT; and Tim Healy’s famous USA 2 HELLEY HANSEN. 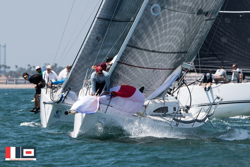 There is a strong presence of Japanese teams, as they are conducting their three-regatta “Japanese National Championship” in order to qualify one of their teams for the J/70 Worlds in September. For those in the TP52, Farr 40 and M32 world, you will recognize some of the leading crews. Makoto Uematsu’s ESMERALDA from Tokyo hardly needs any introduction, he helped create the TP52 class with the support of Newport’s own Ken Read at North Sails. In addition, there is the famous “SLED” team, composed of a number of boats- Hideyuki Miyagawa’s IT’S SLED from Hyogo; Takashi Okura’s SLED from Alpine, NJ; and Eichiro Hamazaki’s THE SLED from Kanagawa. In addition, there is Yasutaka Funazawa’s NATSUKO from Tottori. That should be an interesting competition to watch! For more New York YC One-Design Regatta sailing information Add to Flipboard Magazine. “The Samui Regatta (http://www.samuiregatta.com) is a major event in the China Sea, located in the Doldrums latitudes, with light winds and a few violent clouds and thunder showers in the mid-afternoons- typical of our climate here. As a boat owner, I had the great happiness to have my J/41 SOUAY1 sailed singlehanded up to Thailand. I also felt very proud to invite guests for a ride on her after I installed a full teak deck with an integrated elegant and comfortable teak cockpit (all Burma teak, of course, of the best grade possible I could find!). But now, my happiness was to invite offshore sailors to join my team and, hopefully, sail her fast and smart. Guido Wedekind, a German professional fighter, who lived for years on his 54 ft wooden sailboat. The multiple tasks required for around-the-cans racing placed a very high demand for the small crew on our old 41 ft IOR One Tonner- designed by the famous J/Boat co-founder, Rodney Johnstone. Nevertheless, I am sure you can imagine the satisfaction of everyone onboard our SOUAY1 after a week of sailing the regatta- winning six of seven races! We even crossed ahead of several modern IRC designs in some of the races with light wind spots and tidal current. The old J/41 is quite fast in that light air, flat-water conditions! She is perfectly suited for those conditions here because we see a lot of it throughout the year (monsoon season, notwithstanding!). 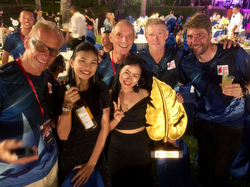 We hope you enjoy some of the photos from our experiences sailing the famous J/41 here in our waters off Thailand and winning the famous Samui Regatta Cup. Wonderful boat. Fantastic, fun crew! Thank you all.” Thanks for the contribution from proud J/41 owner- Jean Rheault. The Tale of Stearn's All-Women Crew on J/88 Hokey Smokes! (Chicago, IL)- Here is the tale of Rich Stearns, his all-women crew, and how they learned to “Put the Dawg on It”! 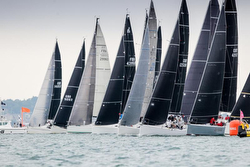 Chicago, the home of many competitive fleets and active sailing, recently hosted the 30th annual Helly Hansen NOODs, June 8th-10th. A popular and successful event, which many Chicago racers hibernate throughout the arctic winter to rally to enjoy their first sip of summer, the Chicago NOODs is always looked forward to as a hallmark of the beginning of racing season. True to Chicago’s knack for unpredictable weather, this year’s NOODs had its fair spread of conditions including: storms, light and moderate air, rain, and the unusual, but always surprising, fog. The fog was not the only surprise. 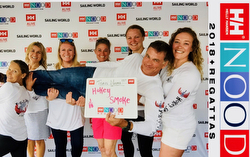 This year, J/88 HOKEY SMOKE owner Rich Stearns made the decision to build his program off the strength and fitness of “girl-power”. Bringing various levels of experience together was going to be a challenge, his all-women crew ranged from mid-twenties to mid-fifties. Racing with an all-women crew is not common in the male-dominated sport of sailing. The J/88 fleet in Chicago continues to grow, and eight teams came out for the Chicago NOODs. The class in Chicago is competitive and will be hosting the J/88 North Americans come August, with over 20 boats expected on the line. During the NOODs, a few other boats carried one or two women crew, but none were fully crewed with women as HOKEY SMOKE was. With postponements held all three mornings, it made the thirst for competition even stronger, as there would be limited races to test/ train the team. Making efforts more difficult, with only two races a day, HOKEY SMOKE’s newly-assembled crew was under pressure to rapidly improve versus the seasoned J/88 crews on the starting line. Stearns’ green crew, started at the bottom of the pack, and worked their way together as a team to finish the final race of the regatta with a third in fleet! But, as with any good result, improvement takes time and focus. On Day 1, the weather, crew work and maneuvers proved to be challenging and offered lots of opportunity for improvement. The AP was signaled at 08:45 and not dropped until 12:00. As HOKEY SMOKE went out to course, they went through the responsibilities of positions, but with limited time before the first sequence to practice tacks, trim and sets. With the first practice set, and a shakeout of some cobwebs, the chute finally came down. It looked like a cat on a leash. It just did not look right. Annie, trimmer, commented to her pitman, Freya, and fellow trimmer, Joy, that it just did not fall well. “That’s gonna be a not good for me,” Annie stated in low, stern voice. And, so the expectation of real crew improvement was born. The team quickly debriefed and checked the kite. With little time before the start sequence, a little more banter was exchanged and the crew agreed there would be no more cats on the leash. “We gotta put a dawg on it ladies!” the crew chief kept coaching. As the first race would sound off, the HOKEY SMOKE team would see where stood against the rest of the pack. Placing last in the first race, the boat was moving slow. But, the crew attitude and spirit was eager to improve their performance. Small communications and adjustments were made. And, trust was being built. Rich debriefed after each race and encouraged crew participation, both to learn and figure out the key boat mechanics and sail trim that were contributing to our lagging performance. He communicated in layman's term clearly. Cool as a cucumber, never once did he stress his decibels during a foul or slow maneuver. Ever so patient, he carefully identified and provided insight to teach and support his crew. To which his team responded well and followed suit, each of the teammates respectfully teaching another, never squishing toes. The biggest challenge for the boat would be the roundings. The leading boats BANTER and EXILE were a guide as we saw their spinnakers wonderfully fill and launch right at the mark. It was clear the HOKEY SMOKE chute was not getting that pop-out like the other boats, and was a failure to launch. The halyard was either too quick on the hoist, filling the chute halfway, or too delayed, the clew catching on the lifeline. The starboard jib sheet was another factor. So was a graceful and clean douse. The timing of hoisting a spinnaker happens very quickly, and when it is done just right, it’s “Goldie Locks”. During the first two days, we had switched the positions at the mast; which changed up the tempo and groove. The command to hoist was getting confused with nearby boats hoisting, as well as “get ready to hoist”. The women crew, as great communicators, quickly established key words and lexicon to clarify the timing and the execution of the maneuver. Ironing out any confusion, the term “bang it” was defined as the proper announcement of when to hoist. By the last race of the day, we were in a groove and were able to dance around the weather mark with a good chute set. Another flaw that we witnessed was that the starboard jib sheet was loaded on the winch at the roundings, not being released when we were furling the jib. The sheet stalled the process, causing some confusion and, more importantly, shadowing the spinnaker from filling and letting the boat take-off. We figured out that the sheet was being loaded from former port lay line tack approaching the rounding. But on a starboard lay line, it had been left on, when there was no need for it. As a crew, a good team is constantly figuring out the “go fast” tricks, or slips that might be dragging you down, keeping the sheet free while approaching the mark was the solution. The take down of the chute always requires careful coordination. Although it’s a step-by-step process, part of racing is that not everything goes as planned. Another source of excitement was “just in time” communications from back of the boat regarding the style of douse. From leeward to Mexican, it was important that the front of the boat be ready on the correct side, and that if a last second decision was made, the crew in front was synchronized with the back of the boat. The bowman on the first day, out of sync, began to bring the chute down by the clew and the leech. During a debrief, a crew-mate went up to explain that, collapsing the foot first on the chute during the leeward roundings is the quickest way to decrease the sail area of a spinnaker, making it ineffective as a sail. Making a triangle with her hands, she collapsed her the thumbs (foot), and showed how the head of the sail theoretically collapses easily down. Over the series, the HOKEY SMOKE crew concluded that whenever beginning something new it is much like, a cat on the leash. But, the effort and motivation to succeed, to do better, to work together, and to have fun while doing it, is what racing is about in any team and sport for that matter. To, “put a dawg on it”, is not only about having a positive humor to improve, but also to do it with a little sass and style, and willingness to identify things that are not working on the boat, and to overcome the obstacles. The phrase became a mantra for the ladies and Stearns, and was a tool that reinforced the new crew skills and communication. 1st Gibbs Hill Class, 6th Overall! 15 of 29 J’s Finish Top 5 in Class! The action started at 1300 hrs EDT Friday, June 15 from Newport, Rhode Island, just beneath the famous Castle Hill Inn & Lighthouse at the port end of the starting line. It was not the “thrilla from Manila”, more like a slow and steady progression, trudging slowly through Chicago O’Hare’s security line, all heading somewhere along the 162-degree rhumbline to Bermuda. The vast majority of the fleet endured a rather bizarre scenario offshore. The big, fast boats basically rode the remnants of a micro-Low, then micro-High to whisk them along most downwind/ reaching to Bermuda; specifically, the Gibbs Hill Lighthouse division maxis- Rambler 88, the Maxi 72 Proteus, and the two Volvo 70s. That group separated quickly into a separate system with a moderate northerly flow and rode it to Bermuda to make up the top five overall in the Gibbs Hill division. Behind them, the weather systems simply deteriorated into nothingness, with wind veering back into the northerly quadrants and dying, with numerous “park-ups” from east to west across the rhumbline for the main body of the fleet. Ultimately, the forecasted southwesterlies and westerlies from an approaching front materialized and those that held to the west of rhumbline faired better than their colleagues off to the east. Benefitting from that unfolding scenario was Don Nicholson’s J/121 APOLLO, finishing at twilight on Wednesday at 0322 hrs for a corrected time class win of 62:21:35 hrs (elapsed of 108:12:52) in the Gibbs Hill Lighthouse Division Class 14. Taking third in class the Leonid Vasiliev’s custom J/120 DESPERADO correcting out just 30 minutes back. 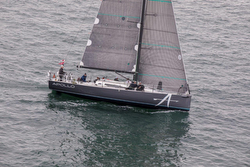 As a result, overall under ORR Handicap, the J/121 APOLLO was 6th corrected time behind the obvious winners in the “breakaway” group in front of the fleet- the two Volvo 70s, Maxi 72, Rambler 88, and a TP52. Fast company, indeed! 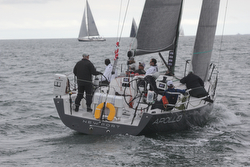 A great debut offshore for the APOLLO team! 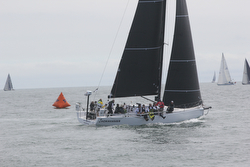 Similarly, the two J/121’s sailing in the St. David’s Lighthouse Division Class 9 (Joe Brito’s INCOGNITO & David Southwell’s ALCHEMY) sailed fast, but ultimately made a fateful decision around 1400 hrs Monday afternoon, gybing east nearly tangential to rhumbline to head further east. It was a move that would seal their fate after leading for much of the race. They were caught a bit too far to the east as the forecasted SW to W winds filled in. As a result, despite alternating provisional leadership of their class halfway through the race, both boats ended up finishing nearly at the same time as their sistership APOLLO. Joe Brito’s INCOGNITO finished at 0246 hrs Wednesday to take 4th in class, and David Southwell’s ALCHEMY finished at 0336 hrs to take 5th. 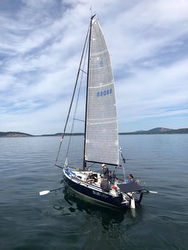 In the Double-handed Division Class 3, Steve Berlack’s J/42 ARROWHEAD sailed a strong race, working their way to the west of rhumbline at the appropriate time on Monday afternoon and reaped the benefits to take the bronze! 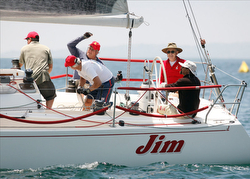 Taking 5th place was Gardner Grant’s J/120 ALIBI. In the SDL Class 5, Fred Allardyce’s J/40 MISTY managed a 3rd, while Eliot Merrill’s J/42 FINESSE placed 5th. What was tantamount to being the sole “J/Boats” division was SDL Class 7- six J/120s and four J/122s in a class of fourteen boats! The very experienced J/120 teams (many whom have multiple Bermuda Races to their credit) swept the first four spots; leading was Rick Oricchio’s ROCKET SCIENCE, 2nd Richard Born’s WINDBORN, 3rd, John Harvey & Rick Titsworth’s SLEEPING TIGER, and 4th Brian Spears’ MADISON. All went west of rhumbline at the critical juncture of 1600 hrs on Monday afternoon heading for the southwesterlies. The first J/120 beat the first J/122 into the island finish line by over one hour. In the final analysis, perhaps the most shocking statistic is that out of the 29 J’s racing Bermuda, fully half of them managed a top five finish in class! As for podium finishes, two Golds, one Silver, five Bronzes for a total of eight medals- nearly 1/3 of all J/teams entered podiumed. Pretty good odds/bets in the greater scheme of things! As J/sailors have learned/ discovered over time, a well-balanced boat that can sail in all-around conditions ultimately prevails, and often wins! Sailor Girl- Nic Douglass- interview with Brad Willauer- Commodore of the CCA and owner of the J/46 BREEZIN UP For more Newport to Bermuda Race sailing information Add to Flipboard Magazine. 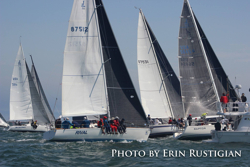 (Cleveland, OH)- The highly-popular Cleveland Race Week started last weekend on the waters of Lake Erie, hosted by the Edgewater Yacht Club for just one-design classes- J/22s, J/70s, and J/105s. The seven-boat J/22 class saw a near whitewash by Ryan Lashaway’s DEUCE team, posting a 1-2-1-1 tally for 5 pts. No one else was even close. It was really a battle for the balance of the podium. In the end, it was Jason Goscha’s DOUBLE-J that took the silver with a consistent 4-3-4-2 for 13 pts. Third was Anna Huebschmann’s ESCAPE with an equally consistent scoreline of 3-6-2-6 fro 17 pts. The thirteen-boat J/70 fleet saw the dynamic duo of Lee Sackett & Dave Kerr simply eviscerate the fleet, starting off with five straight bullets, then backing off on the gas to take a deuce in their last race, closing with just 6 pts total! Ouch. Fellow family member Tod Sackett upheld the family honor by taking 2nd place with 21 pts total. Third was the “Jamaican Sailing Team- Sminchak/ Moose” on SPIFFIT with 23 pts. The seven-boat J/105 class had an insanely inconceivable three-way tie on 4 pts after just two races sailed!! No one would ever believe this wackiness! So, Robert Mock’s UNBRIDLED scored a 3-1. Ron Carson’s DARK’N’STORMY posted a 1-3. And, coincidentally, who got the two 2nds?? Doh! The Uhlir Brothers’ TRIO took the 2-2. How crazy is that? So, the countback/ tiebreak worked in Mock’s favor, winning over Carson in 2nd and the Uhlir’s in third! For more Cleveland Race Week sailing information Add to Flipboard Magazine. (Vigo, Spain)- Final day, final race, final leg. The dueling leaders fought a titanic struggle right to the finish line. The protagonists were Alberto Rossi’s ENFANT TERRIBLE and Peter Duncan’s RELATIVE OBSCURITY. Tied going into the final race, who-beat-who would win the championship. On the final run to the finish, it was Rossi’s ENFANT TERRIBLE crew that proved their toughness, winning the race, with Duncan’s RELATIVE OBSCURITY taking second. One could not conceivably write such an insane script to this Hollywood ending. Needless to say, it will be “party-time” back in Ancona, Italy at the Rossi family household! Sixty-nine teams from fifteen countries sailed the 2018 J/70 Class Open European Championship and 2018 J/70 Corinthian Class European Championship. The Real Club Náutico de Vigo in conjunction with the International J/70 Class Association, and J/70 Spanish Class Association organized the event. Thirteen races were sailed over five days, racing in the stunning Ria de Vigo on the Atlantic coast of Northwest Spain. The Real Club Náutico de Vigo rose to the occasion and rolled out the red carpet for all sailors; it was a fabulous week of sailing and socializing on the western Spanish Riviera! “We sailed well as a team and technically speaking and we had a lot of fun, which is the best way to win,” commented Alberto Rossi. “We made a good recovery and we realized the win was possible only in the last race. We are thrilled that the trophy will be going back home with us. 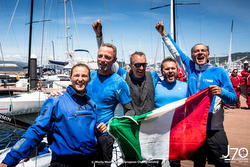 Enfant Terrible has won the TP52 Worlds and the Farr 40 Worlds. Both Claudia's team and mine will be in Marblehead, USA trying to win the 2018 J/70 World Championships, we are father and daughter, but we are very competitive with each other. I will also be competing in the Farr 40 Worlds in Chicago this year. I still love the Farr 40 Class and it has many similarities with the J/70; great racing, highly competitive, and a lot of fun,” commented Alberto Rossi- skipper of ENFANT TERRIBLE. 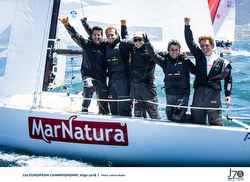 Luis Bugallo's “Marnatura” (ESP) is the 2018 J/70 European Corinthian champion. Bugallo's team (Enrique Freire Faria, Gerardo Prego Menor, Alberto Basadre López, Jorge Lorenzo Romás) representing the host club, Real Club Nautico de Vigo was third in the Open Class. Luis is just 22 years old and is born and bred in Vigo. 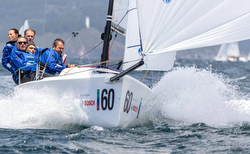 Runner-up for the Corinthian Class was Paolo Tomsic's Società Nautica Grignano (ITA) and completing the podium was Luis Pérez Canal's Abril Verde (ESP) from the host club, Real Club Nautico de Vigo. Final day- YouTube sailing video highlights Follow and share the J/70 Europeans here on Facebook For more J/70 European Championship sailing information Add to Flipboard Magazine. 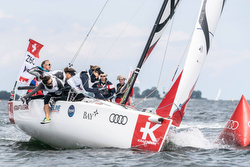 (Kiel, Germany)- The inaugural Women’s SAILING Champions League took place at Kieler Woche in northern Germany on the southeastern part of the Baltic Sea. 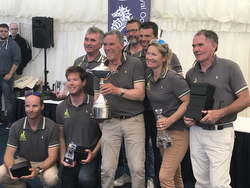 With 10 teams from six nations, the Royal Danish Yacht Club (KDY) and Hellerup Sejlklub made it a one-two victory for Denmark. 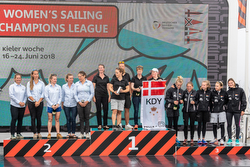 Kongelig Dansk Yachtclub, aka the Royal Danish Yacht Club, won the inaugural event of the brand-new Women’s SAILING Champions League. 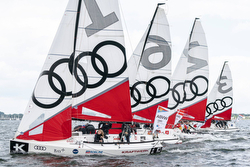 Over the three days of the regatta which took place from June 16th to 18th June during Kieler Woche, two Danish crews dominated the league racing in J/70 keelboats. There were all kinds of weather conditions over the three days, but the final day saw spectacular conditions with a southwesterly breeze blowing at 11 to 13 knots. Each team competed in 20 races across the three days, and the Royal Danish Yacht Club rarely finished out of the top two in any race. Strangely, the final heat proved to be their worst score, although that 4th place didn’t matter because the crew with skipper Henriette Koch, Anne-Sofie Munk-Hansen, Tina Schmidt Gramkov, Helle Ørum Ryhding and Lotte Meldgaard Pedersen had already notched up a commanding lead in the standings. Hellerup Sejlklub (Trine Abrahamsen, Christina Otzen, Katrine Munch Ejlev, Ida Hartvig, & Lærke Marie Sørensen) finished in second place. Both Danish teams were some way ahead of the chasing pack that were focused on who would grab the final podium place going into the last heat of the competition. A first place in the last race gave Akademischer Segelverein Warnemünde team (Johanna Meier, Carolin Junker, Pia Sophie Wedemeyer, Andrea Aachenbach, Lisa Schälke) third place overall, just one point ahead of fellow German team from Deutscher Touring Yacht Club (Laura Fischer, Anna Seidl, Mareike Weber, Monika Linder, Linda Weber) that finished on equal points with Dutch entry International Yacht Club Amsterdam (Rikst Dijkstra, Fettje Osinga, Milah Wouters, Irena Doets, Sanne Crum). SAP Sailing Analytics provided 24/7 additional statistics and data for sailors, fans, spectators and media like GPS tracking, real-time analysis, and live leaderboard combined with 2D visualization. 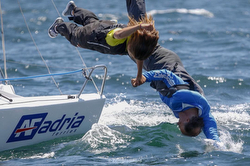 You can find all results on SAPsailing.com (http://wwww.sapsailing.com)! 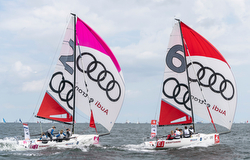 For more Women’s SAILING Champions League sailing information Add to Flipboard Magazine. J-LANCE 12 Wins Class & declared Overall IRC European Champion! (Cowes, England)- The Royal Ocean Racing Club hosted a stellar fleet of thirty-three offshore IRC racing teams from nine countries (Belgium, Denmark, France, Great Britain, Ireland, Netherlands, Poland, Turkey, USA) at their Cowes, Isle of Wight station for the 2018 IRC European Championship. The immaculately sailed J-LANCE 12 was crowned IRC European champion for 2018. 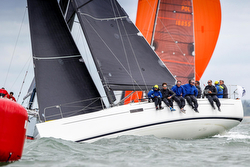 The French J/112E skippered by Didier le Moal seemed never to put a foot wrong in the latter stages of this week-long regatta run from Cowes by the Royal Ocean Racing Club. Winning Saturday’s first windward-leeward race, held in 15-20 knot winds, was the French team's sixth bullet out of ten races. For the final big breeze, double-points scoring, round-the-cans, cannot discard race, the French had the class win secured, but played it safe. "The wind was increasing a bit, so we preferred to sail safely, because we had a big lead. We just wanted to finish well," explained J-LANCE 12's navigator and team secret weapon Nicolas Lunven, the reigning Solitaire du Figaro champion. With the wind gusting into the 30 kts-plus range, they avoided gybing the spinnaker, to avoid breakage. In addition to Lunven, le Moal and Fred Bouvier, the J-LANCE 12 crew of Christophe and Cyrille Cremades, Jean Francois Nevo, Jean-Michel Roux and Cyrille Teston are all friends who have sailed with le Moal for years. In the final race in IRC Three, J-LANCE 12 placed fourth, simply dominating their fleet with a 20.5 pts total, winning with a 30+ points margin. As the Queen once asked about how the British Royalty’s yachts did in the first race against the yacht AMERICA in the 100 Guinea Cup Race (now the America’s Cup), the reply was “your Highness, there was no second place.” That would have been an appropriate response for how the IRC 3 felt after being eclipsed by the French crew on J-LANCE 12. What may have really opened up everyone’s eyes was the performance of the J/112E in the windy, blustery 60nm Round Island Race (the original America’s Cup course around the Isle of Wight). In that race, J-LANCE 12 finished 3rd boat-for-boat in the IRC 2 fleet! A commanding performance it was for the ages. In fact, in what was easily a “big-boat” race for currents and winds, J-LANCE 12 was 3rd overall on handicap time to the first two boats in IRC 1- all full-on stripped-out racing Fast 40s. 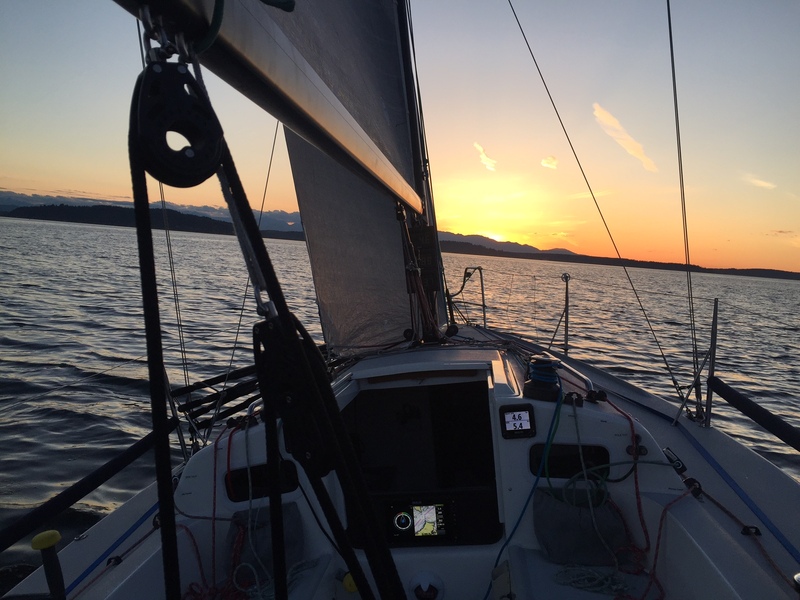 Here is a summary report from Fred Bouvier on their experience sailing J-LANCE 12 in the regatta. “The key to our success was the following: good boat, good crew- all friends, and a lot of fun and parties ashore. While we were extremely focused while sailing, it was the great fun ashore that, for sure, was an important part of our performance. In some way, we were amazed by our results and how we performed against very good professional teams and IRC-optimized, stripped-out racing boats. We had light winds and only one windward-leeward race. Our start was not good! The room at the RC boat was closed at the gun, so we had to a turnaround in just 5 knots of wind and come back to the start line. There was a very nervous feeling on board, as this was not the best way to start the IRC European Championship. Nevertheless, we fully concentrated on our speed and we crossed most of the fleet to round the first windward mark in fifth place! We were still nervous, as we were not thinking that light wind was our best conditions. But, despite this concern, we were second at the next windward mark and, in fact, passing several IRC Class 2 back-marker boats that started ahead of us! Then, we crossed the line just before the wind shut down, thank goodness! Meanwhile, the rest of the fleet was partially parked on the last downwind leg near the finish line, some of them anchoring/ kedging to stay in place because of the current. With no more wind, the RORC PRO wisely cancelled racing for the day. We had medium to light winds all day and very shifty- 15-25 degree wind shifts and very streaky. It was “round-the-cans” random leg courses. The first race was a reaching start, again not best positioning for first leg, rounding the bottom mark around 9th place. Then, we recovered to 6th at the second mark. Then, the next leg gave us a long upwind where we could play wind shifts and we jumped into second place at the 2nd to last mark. Finally, we passed the Danish X-37 Helly Hansen team to finish first. For the second race, it was much shorter, with less upwind. This time, we finished fourth on corrected time after missing a shift and streak on the final downwind run to the finish. Halfway down the run it appeared we were winning the race, but the boats to the windward and right of rhumbline passed us. Our conclusion was that Danish X-37 Helly Hansen team would be very strong competitors. 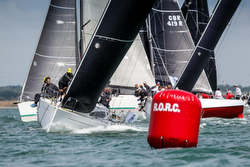 The RORC PRO attempted the classic Round Isle of Wight Race. However, it was never going to happen, even in our own estimation. We started upwind heading west down the Solent towards the Needles, after beating for two hours against the tide in very light winds, it was clear it was not going to happen. For the first time on our navigation software, we could see that it was predicting an arrival time at the finish line as "infinite”…ha-ha! Not surprisingly, the race was then canceled! The fleet then waited for several hours in the Solent, hoping a seabreeze or gradient breeze would fill in. Finally, late in the afternoon, a streaky wind that kept oscillating from northeast to southeast filled in, blowing 6-12 kts. The first race was another long round-the-cans affair. It was a great one for us! We beat the Danish X-37 Helly Hansen and the French First 40.7 Pen Koent; winning both on elapsed and corrected time! The final race was a very short windward-leeward in light, dying winds. There were a lot of issues playing with the bigger IRC 2 Class in front of us to avoid bad air from their ‘back-markers’. The X-37 was still fighting hard, but we succeeded in passing them right at the finish line, so we won another race on corrected time. We had one long and intense round-the-cans race all over the Solent in medium winds of 12-17 kts. It was yet another reaching start (which we did not like, of course). We spent the entire race working hard to beat the two French teams- the JPK 10.80 Shaitan and the First 40.7 Pen Koent. Surprisingly for us, the Danish X-37 Helly Hansen did not appear to sail as well in the breezier conditions. As a result, we started to think that maybe it was optimized for light winds and the ORC rule. Later, after dinner, I did some research on the Internet and I found the Danish X-37 was 2nd at the ORC Worlds in 2016 and was also rated lower than us in ORC! Interesting! Day Five- Thursday- the Round Island Race! This was an amazing day for us! Finally, we were able to sail the Round the Island clockwise in proper yachting conditions- 20 knots average wind speed, gusting to 27 kts, beating against the strong foul tide for almost three hours! The fleet split off the starting line, one group of six boats went the north shore route up to Lymington, the other short-tacking along the south shore beneath the Isle of Wight cliffs. It was a brilliant windward leg for us- three hours to exit the Solent upwind against the tide, except for the last 30 minutes when it changed. We rounded the Needles mark first in Class 3, but as well first in Class 2 in front of the First 40 and the King 40- they were clearly shocked we were that far in front of our IRC 3 Class! The interesting point on the long upwind leg is that we had a small failure in our outhaul purchase system. So, while we were beating in the middle of class 2 and 3 after having a not so good start, we were tacking every 5 minutes to gain places. Meanwhile, to fix the outhaul problem, I was working on the aft face of the boom, while we were passing one after another of our competitors that had all crew hiking very hard. I did see some faces on several crews, looking amazed by our performance, especially with me standing to leeward of the boom and wheel doing the repair! Then, it was a long downwind run against the tide (again!) where a JPK 10.80 and Sunfast 3600 took the inside line below us for less tide going to St. Catherines Point. The wind against tide at the St. Catherines “overfalls” made for enormous, steep, breaking waves. As we passed the point, their position inside was a good gain for them, so we dropped to third place on elapsed. However, from that point down to the next turning mark, we stayed within a few boats length of them for the remaining downwind run, as well as the short reaching leg, before heading back west down the Solent for the last long upwind leg. We were very fast on this leg, going higher and faster than the JPK 10.90 Shaitan and the Sunfast 3600 Redshift Reloaded. We were just caught by one Class 2 boat by the finish line. And, we were fighting the battle to gain back first place in our class, which we did! We crossed the Royal Yacht Squadron line off Cowes about the same time as the Sunfast 3600 and the 3rd place IRC 2 class boat! Another huge win for the J-LANCE 12 team! Our doubts about the Danish X-37 Helly Hansen were true, in more breeze the performance of the boat really dropped off compared to the whole fleet, always looking overpowered or not stable on any point of sail, they finished last in IRC 3 Class. We had two more identical windward-leeeward races in medium winds of 12-17 kts. In both races, the same scenario played out for us. We started conservatively and were leading by the first windward mark each time, sailing ahead of the fleet to secure two bullets. We had two more races on the final day. The first one was yet another windward-leeward race. Just like the day before, in 17-23 kts of breeze, it was a conservative start, and then we led all the way around the course for another bullet. Then, the final race was a double-counter that could not be discarded! It was a long round-the-cans “Solent Tour”, with wind forecast to 25 knots and gusting over 28 knots. With such a big lead on points, we decided to sail conservatively and avoid any wipeouts or breaking something that would force us to retire. On top of that, the previous night saw an even longer and fun party than the previous one! So, several crew were quite tired and not at full capacity! Despite sailing one reaching leg without spinnaker, while everyone on board was feeling a bit embarrassed, we finished 4th to secure the win with a 30 points ahead of the French First 40.7 Penn Koent. It was a fantastic week and the highlight was for sure the boat and its performance. I am still astonished by how she achieved this performance, while being a pure cruiser-racer and carrying a lot of comfort inside. The other success factor was the crew; we know each other quite well, and we had a good experience sailing the J/112E. Nevertheless, most importantly, we had what I called the “fun factor”- spending good times ashore all together and not taking this too seriously. We know the other professional crews went to sleep early and were up at sunrise each day. Not us! We would enjoy our morning coffees and croissants and stroll back down to the boat again in time to leave the docks each day. 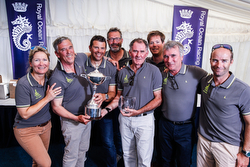 Chris Stone, Racing Manager of the Royal Ocean Racing Club commented, "The IRC Europeans and Commodores' Cup have been an overriding success and all the competitors are happy. The racing has been a complete test with the full range of strong tides, heavy weather, light conditions and sun and rain. There were a couple of standout performances and I congratulate J-LANCE 12 crew as worthy winners. Otherwise, the racing was incredibly close at this third European Championship, showing that IRC remains in great health." For more IRC European Championship sailing information Add to Flipboard Magazine. 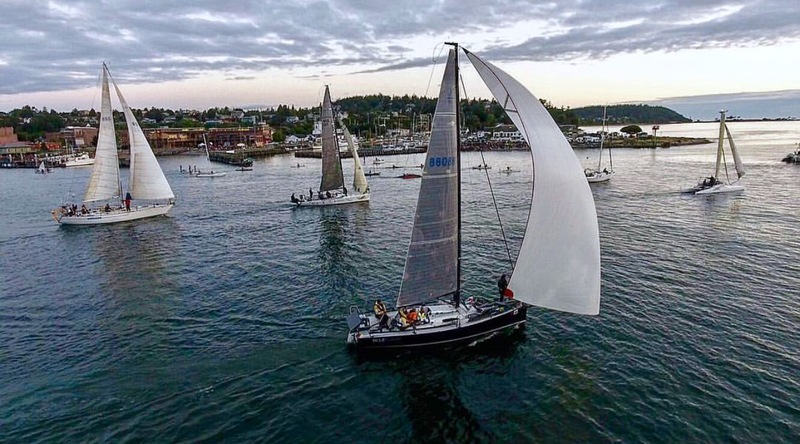 (Port Townsend, WA)- On Saturday, June 16th, the infamous Race to Alaska started off Port Townsend, WA for the first qualifying leg of 40nm. Then, on Monday, June 18th, the “real race” took off to Ketchikan, Alaska for over 735nm up fearsome straits with currents up to 15 kts, tornado-puffs pealing down hillsides like 40 kts microbursts gales, and even snow midsummer off the Canadian maritime provinces of British Columbia and the “inside passage” north to Alaska. The weather can be fearsome. A race not for the faint of heart, that is for sure. Scott Grealish’s son Sean and five other crew members all under-25 are sailing their J/88 BLUE FLASH and hope to be the first boat to finish and win a cash prize of $10,000. That they even finish will be a reward in itself as the youngest adventurers ever to accomplish that feat. 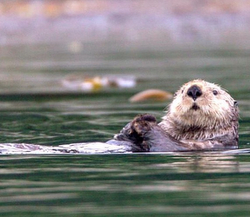 Here are some of Scott’s daily updates on their progress north to Ketchikan. The team made an incredible start out of the harbor, and worked really hard to build a lead in super light air and against current in the early going. Really good stuff. They had a tough decision to make at Turn point, and in the pre-race briefing, we had discussed going out of Boundary pass if they were late to this point.....but they went inside in a gamble to get up to Active pass before the current turned against them.....and it almost worked!! At that point, with just a few more knots of breeze, they could have punched out into the straights and had a commanding lead. It wasn't to be. They made a choice to go north to the next pass, Portlier, which had a 3 am window of slack to allow them through...but they were fighting the ebb current in light air and you can see on the tracker that they bailed out and just hung around Active pass for hours waiting for their chance to get through there instead. I'm pretty sure that was a decision based on fatigue from a long hot day of pedaling and light air sailing. In reality, if you got to turn point late and elected to go inside, you needed to 100% commit to going up to Portlier (as the race winning PT watercraft did). That would have put them right where he is now, literally 25 miles at least ahead. But as luck had it, the outside boats got just enough breeze to creep up north overnight, and the tough luck is that today the southerly boats haven't gotten the wind (as we expected) and so the boats in front will extend the lead and things look pretty grim for now. BUT, that same idea works both ways, and here is my two cents on what's up next. The light air zones in the straights will persist with all this high pressure today....and there may be some southerly even at times and places that could bring them back. But by late tonight/early am there should be real southerly breeze that could bring the fleet back up towards the leaders. PLUS, the next big "gate" to get past is Seymour Narrows....and if the leaders get there any time other than slack, they have to wait up to six hours. So once again, a little luck can either get you way up the course or bring back the fleet to you. The next wild card is the actual Johnstone Straight. They can get past the narrows by pedaling (it's short) but all the teams will be very challenged if the light air continues as forecast and they have to manage the entire straight under mostly human power..... The team knows this, and the pre-race plan was to pack in the sleep today/ tonight so they can power thru. Once the leaders (whoever they are) clear that hurdle, they will be very hard to catch. It's been a crazy race so far! Wow! Big gains overnight for Team Blue Flash. As expected, the southerly breeze came and brought them back into this race. I'm sure there are smiles onboard this morning, as they are finally getting a chance to show they are good sailors. They took 10 miles out of almost everyone, sailing away from the Olson 30 Dreamcatcher, and taking time out of the leaders. I'll reveal my secret weapon now: It's called the A2PHRF kite. At 103 sq meters, it's much bigger up top than the typical 89 sqm J/88 kite. Great for this stuff. Version one took us to several victories (until Cal Offshore week when it went from 20 to 30 knots quickly and Andrew H (included here so I can tease him yet one more time :) found out that at 19 knots boat speed even he can't keep the J/88 from wiping out when the rudder cavitates!) So, we shredded that one. But version two was cut even better for some reaching, and used only in the Mac race (served us well). New sails are fast! The big story: The girls are nearing the tidal gate at Seymour Narrows, but they are going to miss the 10:30 ebb by a hair! That means they get their turn to sit while the Blueflash gets until 4:30 to get there. So, it's race restart at Seymour Narrows!!! Then they all go thru and guess what? It's a 10.6kn flood! So, they all sit on the other side in Brown's bay until 11pm. Then when they finally get the ebb....there won't be any real wind! Got a great text around noon from the team: "Team is in really good spirits. Great trip so far". After worrying about them half the night getting thru the Seymour Narrows and Johnstone Straits, that was a good text! Sean started dreaming about this race two years ago, watched every video, analyzed all the tracks, talked to prior participants, and set out with one goal: Create an all youth team and be the youngest to finish R2AK. I bring that up because, naturally, in the prep and early stages of this R2AK, they clearly were out there with competitive ambitions. I'm thinking right about now they are stepping back and realizing that R2AK is really all about challenging yourself in the company of like-minded (crazy) people. And, they are having a great adventure! For the moment, they look good coming through Johnstone Straits without getting into big headwinds. The leaders are about 30 miles up the course, but considering the team stopped for a few tidal gates on the race so far, it's actually pretty cool there is this much company near the front of the fleet. I think things could get closer, actually, as the leaders enter back into the channels to Bella Bella and the chasers look like they'll be reaching fast. And, a forecasted gale will slow the others down, while the J/88 can keep sailing! I think Russell Brown on PT Watercraft (solo guy on a Gougeon catamaran, who stops every night) is sleeping more than I am this week! Remember, they will lose cell coverage soon, so not likely to hear much until Bella Bella. I'll relay any sat phone updates I receive. I got a call from Sean. All good. 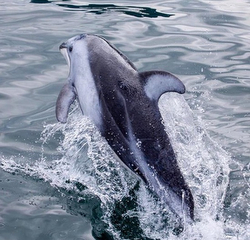 They tried to get out of Johnstone Strait, but got flushed back. No wind, much more current than charts suggest. Trying again on this next cycle. Conditions change quickly and don't reflect what we see online. Talks five minutes, then wind built from dead to over 15 kts. “Gotta go Dad”! He confirmed they missed Active Pass by 45 minutes, so the ten mile lead turned into a ten mile loss. They tried for Portlier, but couldn't make berthing/ docks against the current. Their pedal drive is not up to the other leaders level- like the “girl power” in front of them. He said the leaders went thru Seymour Narrows with nearly max ebb in no breeze (up to 15 kts!). Gutsy call. They would have had double that current, so they waited. They skipped the next slack to flood, as they didn't think they could get into Brown's Bay and would get flushed back through Seymour Narrows! 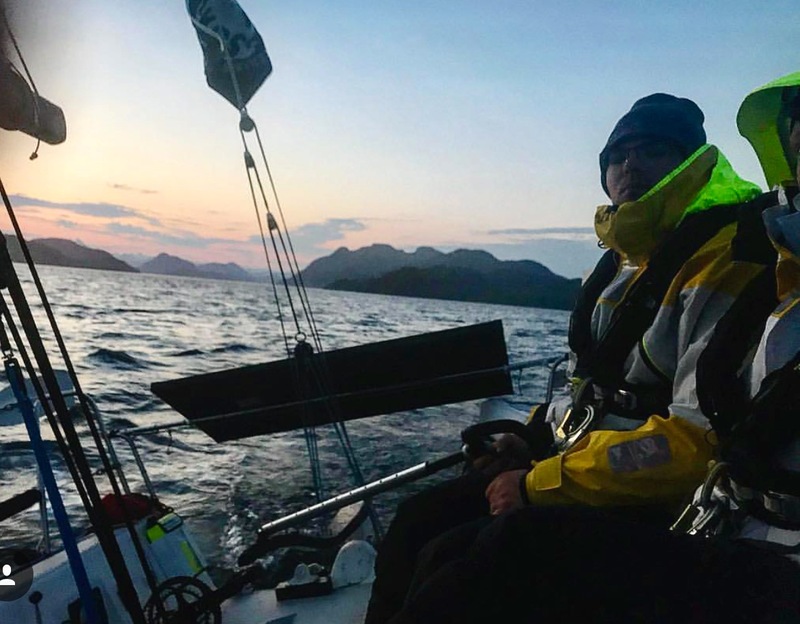 In any event, they timed their Johnstone Straits run perfectly, to get to Helmken Island, as planned, and out of the powerful currents flowing down Johnstone Straits. They know about the dissolving omega block, approaching Low (depression), gale warning for Johnstone Strait. That should help them a lot against the leaders- the J/88 can handle that, not so sure about the others! They are going to need water and battery recharge in Bella Bella and plan to stop. They are thinking things through and playing it conservative. They told me to tell Stu Johnstone that you can hit a large floating tree at 5 knots going upwind in a J/88 and it doesn't leave a scratch! I guess that proves the logs don't go away at night....Go BlueFlash! More news when it’s fit to print next week! Or, follow “LIVE” at the links below. Fascinating race!! Follow the Race 2 Alaska on Facebook here For more Race 2 Alaska sailing information Add to Flipboard Magazine. (Toledo, OH)- J/34 IOR KNEE DEEP is at it again! Will they ever slow down?? 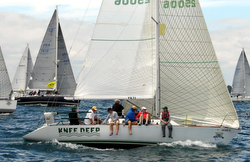 Knee Deep continues to sail its way back home, via the Mills Trophy Race. 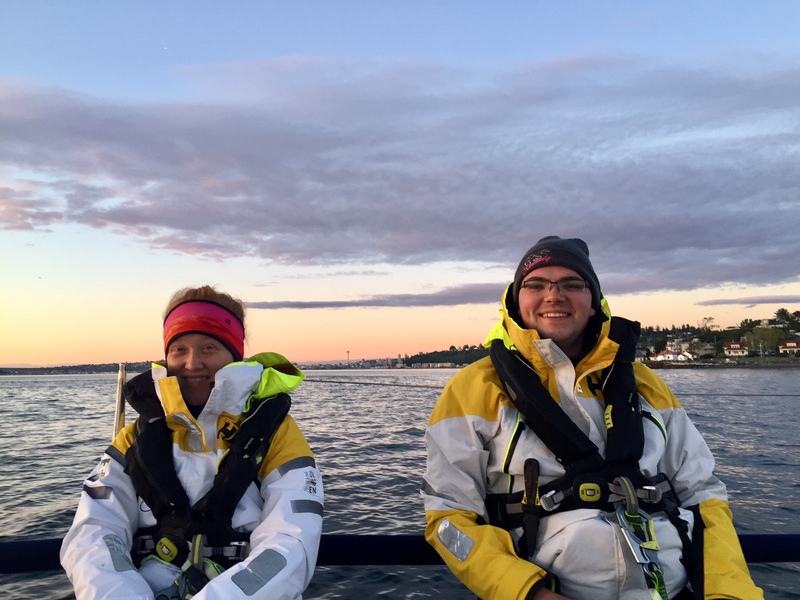 After a fast start to the season in Detroit, racing the Detroit YC Memorial Day & Bayview One Design Regattas, Katie and Brett Langolf headed south to Lake Erie's North Cape Yacht Club, then to Toledo for the annual night race across Lake Erie. You do not only round marks on this race, you factor shoals, islands and even a military shooting range into the course! But, regardless of the obstacle that night, it was upwind and more upwind - something the J/34 IOR loves a lot! They hammered out a 3rd in Class on the President's Trophy Course. Next Up Cleveland Race Week Women's Race and then the CRW Offshore Regatta! Add to Flipboard Magazine. (Long Beach, CA)- Having one of its best turnouts in years is the annual Ullman Sails Long Beach Race Week, hosted by Alamitos Bay and Long Beach YC’s. With three race areas to manage, the club’s PRO’s have their hands full with large dinghy classes, one-design keelboats (J/70s and J/120s) and large PHRF handicap classes. At this time of year, just about anything goes; from the classic “June Gloom” of early morning fog, ultimately burning off to provide decent sailing conditions in the local seabreeze, or the brisk “Santa Ana” conditions that whistle in from the northeast dry and hot and blowing dogs off chains- often well into the 20-30 kts range. To date, the forecast looks positively like Long Beach Chamber of Commerce conditions- sunny, moderate 6-12 kts winds from the SSE. Looking forward to classic SoCal weather will be the half-dozen boat J/120 class. The usual suspects will be in attendance from the region. As was the case for the earlier San Diego NOOD Regatta, this class can be hard to handicap since they are all well-prepared, with good sails, and the only variables seem to be trimmers and tacticians! At San Diego, John Laun’s CAPER set the pace early, fast, and never relinquished their lead. Similarly, Chuck Nichols’ CC RIDER challenged them but could only manage 2nd place. Third was Ernie Pennell’s MAD MEN. Planning on upsetting that apple cart will be John Snook’s JIM, Tim Hogan’s SHAMROCK, and Rudy Hasl’s HASL FREE. The J/70s from across California have showed up “en masse”, with twenty-nine boats on the starting line from as far afield as Valle de Bravo, Mexico; San Francisco, CA; Puerto Vallarta, Mexico; and even Arizona YC in Arizona! The entire top five from the San Diego NOODs will be striving to maintain their performance. Winning was Bennet Greenwald’s PERSEVERANCE, 2nd was Chris Snow’s/ Jeff Brigden’s COOL STORY BRO, 3rd was Jeff Janov’s MINOR THREAT, 4th Chris Raab’s SUGOI, and 5th Fabian Gomez-Ibarra’s VAGAZO from Mexico. Looming like a raptor ready to pounce on a kill are several top teams that have notable sailors on board that were not sailing the SD NOOD event. For starters, there is West Coast J/70 Champion Bruce Golison on MIDLIFE CRISIS, then there’s Argyle Campbell (world famous sailor from Newport Harbor YC that needs no introduction), and, finally, down from San Francisco is Chris Kostanecki’s JENNIFER (a top 3 contender at the 2016 J/70 Worlds on the Bay). Fun and games it will be to see how the dust settles after the long weekend in this class! 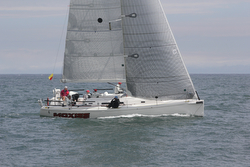 In the PHRF handicap world, we find Doug & Jack Jorgensen’s J/111 PICOSA racing in PHRF B class. Then, in PHRF D class there are three J/105s (Scott McDaniel’s OFF THE PORCH, Juan Lois’ ROCINANTE, & Bill Quealy’s J-RABBIT SLIM), Heinz Butner’s J/109 RAPTOR, and David Boatner’s J/35 RIVAL. In the PHRF Random Leg C class is Paul Stemier’s J/44 PATRIOT, as well as Seth Hall’s J/124 MARISOL. Sailing PHRF Random Leg D class will be Jack Mayer’s J/109 ZEPHYR. Sailing photo credits- Erin Rustigian and JoySailing.com. For more Ullman Sails Long Beach Race Week sailing information Add to Flipboard Magazine. “We wrapped a wonderful District 1 Championship with twelve teams racing in quaint and historical New Castle, NH just next to Portsmouth. 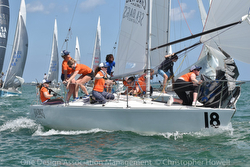 The regatta qualified one berth for the 2019 J/24 World Championship in Miami, Florida. Mental Floss from Long Island joined the competition, but the majority of the competitors were local or from Maine. On Saturday the conditions were light, almost too light to race, but the race committee was able to get off 2 races. In the first race, local knowledge paid and the two locals who went left toward shore rounded the windward mark way in front of those who went right (the majority of the fleet). Andrius Keturakis with Bad Dog finished first and Caleb Sloan with Blue Scoop finished second. In the next and last extremely light air races, three boats from Maine took the 1-2-3 spots. 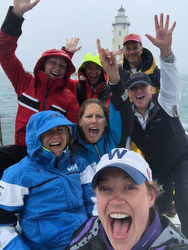 Carter White’s team YouRegatta pulled off a bullet, followed by Erica Beck Spencer’s team, the Sea Bags Women’s Sailing Team, followed closely by Andrew Carey’s Mr Hankey. Knowing that we were only going to get one good day of racing in and had to be off the water by 1530 on Sunday, the race committee made the decision to start us at 1000 hrs on Sunday. Sunday morning arrived and the chilly breezes made many of us think about wool socks and winter hats. The forecast was for a high of 58 F, the breeze was on, and so were the waves. The race committee was able to get off SIX races on Sunday! Amazing! Some of them short, like dinghy courses. And, for those of us who couldn’t get off the starting line, sometimes seemed too short!! Six races with little time in between each race, made it seem a bit like a blur to the competitors. But, Carter White’s team, YouRegatta hammered the fleet all day. With 8 races they had a total of 11 points after the drop— 5 bullets! Aidan Glackin’s team from Lloyd Harbor on Long Island, finished in second place. 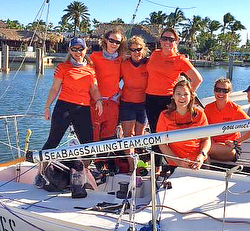 The Sea Bags Women’s Sailing Team finished in third and qualified for Worlds, as the top two teams had already qualified!! 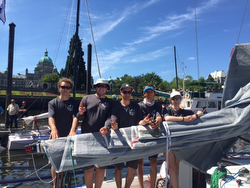 Finn Hadlock’s BOREAS team and Andrew Carey’s team tied for fourth, but Finn won the tiebreaker. To give you a sense for what the conditions were like when the breeze and waves were on, we spoke to Aidan Glackin about driving upwind. Aidan is consistently one of the top Corinthian sailors at events. He said, “We experienced some of the toughest driving conditions on Sunday. The large seas and diminishing wind made it incredibly difficult to drive. It took us most of the day to realize the genoa would backwind when you were coming down the wave and load up going up the wave, you really had to concentrate on driving straight and not chasing the telltales.” Tough driving conditions for sure. Overall, Rob Pruyn, Lenny Cushing, Peter Follansbeeand and the rest of the team of volunteers did an amazing job pulling off a great event. From the looks on people’s faces and the number of teams that stuck around for the awards ceremony, it is clear that all are looking forward to going back to race there again another day!” Add to Flipboard Magazine.